Job 26:8 - He wraps up the waters in his clouds, yet the clouds do not burst under their weight. Job 35:5 - Look up at the heavens and see; gaze at the clouds so high above you. Job 36:28 - The clouds pour down their moisture and abundant showers fall on mankind. Job 36:29 - Who can understand how he spreads out the clouds, how he thunders from his pavilion? Job 37:16 - Do you know how the clouds hang poised, those wonders of him who has perfect knowledge? The picture below was taken in Colorado at a place by Gem Lake. Clouds are spectacular creations by God and incredibly varied. 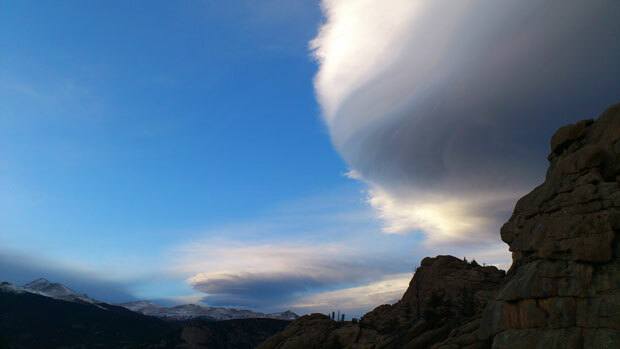 The cloud coming over is called a lenticular cloud that often forms over mountains. 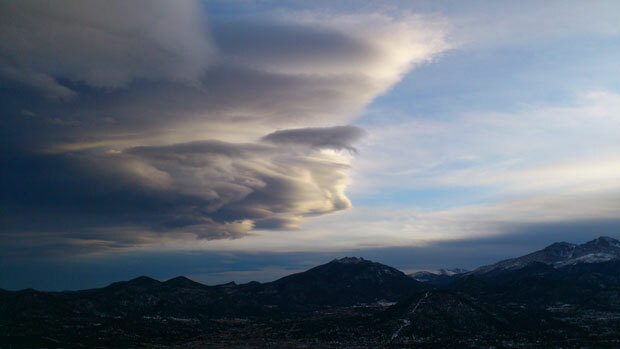 They can look a bit spooky, almost looking like a UFO or a 'hat' over a mountain. We can sometimes forget quite how awesome God is. He created the entire world - every cloud, every creature, every plant, every day. He also holds the whole world in his hands. The verses in Job tell us how God wraps up water in clouds yet they don't burst under the weight! The clouds are different every day and can cover the sky or part of the sky. They float past on the wind, held up almost by some magic force. Yet they are essential for mankind - we need the water that clouds take up and then release to live. While science and meteorology (study of weather) can tell us many of the 'ins' and 'outs' of clouds, no-one can fully explain them. In the same way, we cannot explain God. By nature, God is beyond our understanding. He is above what we think and as Job found out, he is beyond anything and when we see God as he truly is, it leaves us speechless and in awe of him. Job 42.1-3 - I know that you can do all things; no purpose of yours can be thwarted. You asked, ‘Who is this that obscures my plans without knowledge?’ Surely I spoke of things I did not understand, things too wonderful for me to know. A Prayer: Lord, I know that you are beyond my understanding and above everything. Yet you know and love me completely. Your ways are higher than mine and you are the one who holds the world and my life in your hands. Thank you that you are at work in my life uniquely as you made me unique. You are working all things for good. Amen.